Hi everyone! Kate and Tori are finally here! It took us over half a year to get back to our blog, but we sincerely hope to stay for a good while ;) We are going to share more finds, smart talks and little treasures. Please stay tuned! This week's featured shop is Teresa's Primitive Treasures. When Kate just opened Etsy as a regular user, not even a shop owner, this darling shoppe was one of the first stores to catch her attention. Growing up in rural Pennsylvania, surrounded by a large family, I've always had the desire to create. Living on a farm, I remember waiting patiently for the feed truck to come each week in anticipation of the new feed sack prints. If only I had a few of those for today's creating! The area in which I now reside, just like my home, has many Amish families living nearby which is a constant reminder of the simple life! In 1989, I began creating Amish dolls for a local gift shop which began my interest in selling my handmade crafts. Since that time I've added many new treasures and started attending craft shows. My husband creates the wooden pieces and I do the finishing. It's been hard getting him to understand the look of primitives and not making everything so perfect. Together we make a good team! 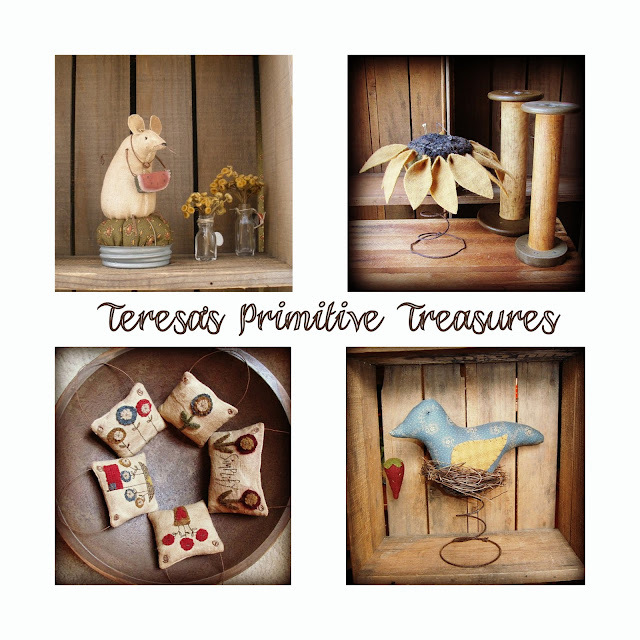 In 1996 I opened an online shoppe,Teresa's Primitive Treasures, to sell my wares which has opened up a whole new door! I've meet some wonderful people over the years and now you can find my treasures in shops across the US. Find Teresa on Facebook, Twitter, and Web. Thank you for the kind words and the feature on your blog! I'm glad my work has inspired you! Yipee you're really finally here! ♦♦ What a cute feature!! hope you are having a most wonderful day in your spot of the world!! Wish you a wonderful time too on this week-end!